This level has medium difficulty. 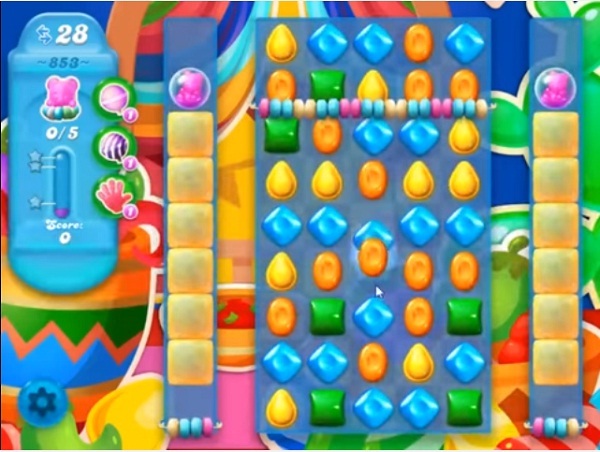 For this level try to play more middle part of the board and make striped candy as you get the chance. Combine them with each other to break corner blockers and to move bear. Why do I only have 25 goes at this when all helps have 28? I rarely get the boards that are shown on here. After about 30 or so. NO WAY AM I GOING TO GET THIS LEVEL CANNOT GET THE LAST BEAR ABOVE THE CANDY STRING NOT ENOUGH MOVES NEED A MIRACLE TO GET THIS ONE. I’m giving up this level really is impossible to pass!!! PLEASE PLEASE HELP ME GET THIS STARTING ON MY 3 WEEKS I HAVE BEEN TRYING TO GET THIS LEVEL CANNOT GET THE LAST BEAR CANDY CRUSH SODA MOM SEND ME HELP PLEASE MOST DIFFICULT LEVEL I HAVE EVER ENCOUNTERED DONT KNOW WHAT TO DO. Can’t get the 5th bear above string. Soda bottles don’t even come up so that there is enough liquid. ? 26 moves is not enough for this level, why give 2 free hours with an impossible level which will not be won until it’s time to win it, complete waste of time and also boring. No fair! King doesn’t release all the water bottles for me to break them and raise the water, so there is no way I can pass this level.